Black widow spiders, as the name suggest are famous for their sexual cannibalism, a practice where the female eats its partner soon after mating process ends. The venom of the female spiders is three times stronger, making the poor male defenseless. These facts have made scientists curious to know, how does the male approaches female for the mating without being confused for prey. According to the new research, male spider when like to date a female, jolt their abdomen in a peculiar way, which inform the females about their intentions. The vibration produces by shaking of the abdomen are markedly distinct from the ones produces by other creatures moving on the female’s web. These vibrations as compared to twerk by the researchers need to be mastered by the male because one wrong move can cause them with their lives. The researcher from the Simon Fraser University, Catherine Scott explained that the web acts as an extended sensory system for the spiders, any movement on these threads alert the spider about any potent prey. So, any male with a love proposal need to make their counterpart clear about their existence and desirability so that the predatory instinct does not emerge. The research team along with Scott and her colleague Samantha Vibert and Gerhard Gries, SFU biology professor studied the vibration produced in the web of a female black widow by male black widow spiders (Latrodectus hesperus), hobo spiders (Tegenaria agrestis) and other insects such as house flies and crickets. These were recorded and upon analyzing carefully they found that the vibrations produced by the black widow spider and hobo spider in order to woo the female were distinct than the one produced by insects. The potent mates were generating low amplitude vibrations for longer duration, which are different from the vibrations produced by prey insects trapped in the web that are irregular and of high impact. 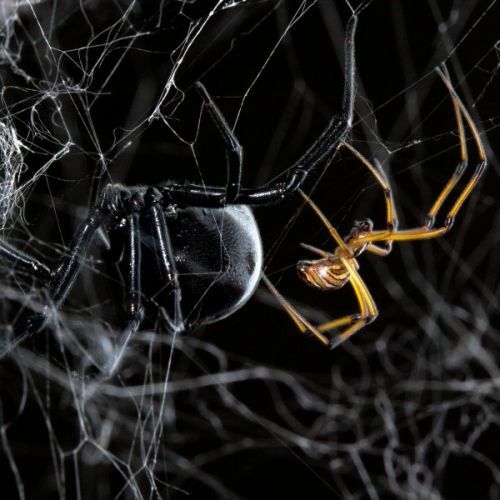 The researchers say that the low amplitude vibration does not evoke the predatory response in the female black widow spider, however strong vibration make them aggressive and ready for the kill. Well apart from friendly proposal, these unique vibrations help male spiders to cut the threads of the female in case the female changes her mind and try to attack them. This shows how little we know about these creatures and their elaborated communication system. The animal kingdom has lots of such interesting facts to unfold.